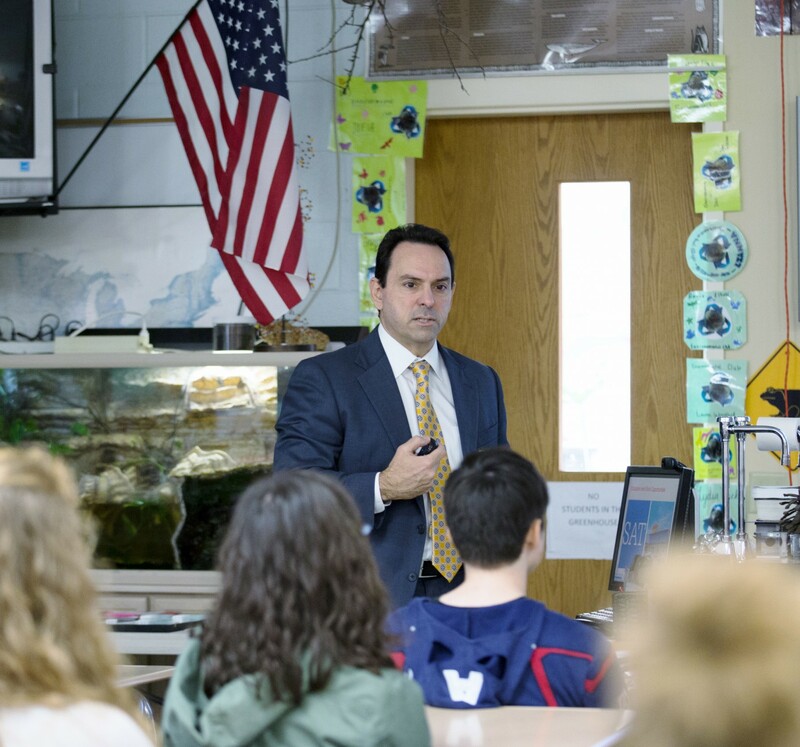 BHS science classes got a dose of inspiration and advice recently from the BEF’s 2015 Scientist-in-Residence, Dr. Ted Teknos, of the James Cancer Center. Dr. Teknos, who did not speak English before the age of six and whose father, a Greek immigrant, had to leave school and go to work after the sixth grade, spoke to students of the importance of heroes and mentors in his rise from humble beginnings to his position as the chair of head and neck surgery at the James. Of the three keys to success, said Dr. Teknos, brains and talent are the least important. Hard work comes first, followed by friends and mentors who give help along the way. Dr. Teknos focused his presentation on his own heroes and mentors. Topping the list, along with his uncle, was Bexley alum and cancer research pioneer Dr. Judah Folkman, whom he met while studying at Harvard Medical School. Teknos attended a lecture in which Dr. Folkman described his revolutionary discovery, angiogenesis, the development of new blood vessels from existing ones. This process, Folkman found, is key to the development of malignant tumors. Folkman’s lecture helped nudge Teknos towards joining the fight against cancer. “Dr. Folkman was a hero and mentor to thousands of medical students,” said Teknos, “including me.” The endowed Dr. Judah Folkman Scientist-in-Residence Program at BEF that supported Dr. Teknos’s visit was established by the Bexley High School Class of 1950 to honor their pioneering classmate. Another hero of Dr. Teknos was medical school classmate Dr. Jim Yong Kim, who while still a student developed a program to bring AIDS drugs to Africa. Dr. Kim is now president of the World Bank. In addition to mentorship, Dr. Teknos said, he achieved his goals through hard work, beginning with an after-school job at Denny’s, and including a five-year medical residency of 150-hour work weeks. For more information about the Dr. Judah Folkman (Class of 1950) Science Endowment Fund and other Bexley Education Foundation endowed programs, click here.